Occasionally I hear about someone doing something so simple, powerful, and admirable that it makes my jaw drop a little. It also often makes me wish I'd thought of doing something like it first. 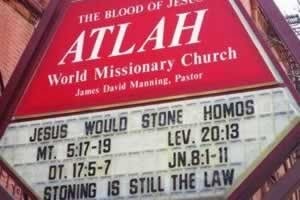 Some of my readers may have heard about the Atlah World Missionary Church of Harlem, New York, whose pastor, one James David Manning, put the message "Jesus Would Stone Homos" in front of his church last week. This isn't the first time that Manning's church has posted homophobic messages. Two weeks ago, in what may be a world record for the number of different groups offended by the fewest words, he simultaneously pissed off feminists, atheists, LGBTQ people, non-racists, and liberals with the sign, "Obama has released the homo demons on the black man. Look out black woman. A white homo may take your man." He even had a YouTube video -- now removed -- in which he said, "Stoning of the homos is now in order. Stoning is still the law." It's an open question how reasonable people should respond to this sort of thing. Being that here in the US we're guaranteed free speech, it is Manning's right to post stuff like this. But a lot of us feel a sense of impotent rage that he can get away with it. Shouldn't there be a way to shut down his message? Jennifer Louise Lopez found one. Lopez showed up at Manning's church, and while someone videotaped, she told the person who answered the door that she was a lesbian, and was there for her stoning. Lopez: I saw your sign. And I'm here for my stoning. I'm a lesbian. You guys are going to stone me? ...Is it you that's going to stone me?" Man at church door: No, I don't have any stones. Lopez: Are you going to send a person to stone me? Man at church door: He's not here. Come back tomorrow. Lopez: So, you're not going to stone me? All right, thank you. There, I think those should be enough. Dear biblical literalists: I'm standing with Jennifer Lopez, and with, I think, a great many other Americans. We admit our transgressions against biblical law. We're all here to be executed. Go ahead. Pick up a stone, and throw it at us. ...and let he who is without sin cast the first stone.